Batch 6 Training will start in April 2015! PISO Advice in Dubai & Abu Dhabi this Eid! TGFI Global Summit 2015 in Singapore! Watch our OFSI YouTube Video! To inspire and empower fellow OFWs and their families in building strong financial foundation and investing in financial instruments such as stocks and bonds. To provide a platform for OFWs in advancing their investment knowledge through collaborative learning, personal objective planning and group advocacy. Every OFW and their families are financially literate with strong personal financial foundation and investments in various instruments available to achieve financial freedom and abundance. Overseas employment is no longer a need but only a choice for most Filipinos. "Be Real Heroes OFWs. Be heroes of yourselves first and foremost so that you can be a real blessing to more people – not just for your immediate family but to your friends and communities." As a young poor boy from the countryside, I only had one thing that brought me to where I am today. It brought me to a University in Manila with a full scholarship grant. It brought me to the Middle East as an OFW for more than 15 years now. It brought me to where I am now in my career. It is my dream. The dream that I nurtured through the years. It is the dream to provide for my family, to break the cycle of poverty in my family and to become rich so that I can be a blessing to the people around me. Just like many Filipinos I thought that overseas employment is the only way to achieve my dreams, and that two years of working overseas would be enough to earn what I need. But then now I am completing my 17th year as an OFW and still working on my financial goals. I realized early on that two years is really not enough, which is why I searched for opportunities on how I can grow whatever I save. 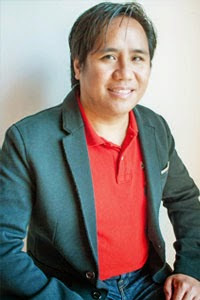 This is when I stumbled upon Personal Finance advocates like Mr. Francisco Colayco and eventually, Truly Rich Club of Bro. Bo Sanchez. I started investing in Mutual Funds 10 years ago and directly with Stocks in 2010. It was difficult for me as I have very few friends who are investing in financial instruments. My family does not even know that stocks and bonds exist. I don’t have personal investment mentor either whom I can talk to and guide me on which strategy can work better for me. At that time, there were no financial literacy sessions for Filipinos in the Middle East. Nevertheless, I just continued and motivated myself through self-study and from virtual mentors. I am just so grateful that along the way, the online presence of many financial literacy advocates as well as the Truly Rich Club is making it easier for many OFWs like us who cannot attend sessions in Manila. From the time I learned about personal finance and investment instruments, I have always shared whatever I learn with my OFW friends hoping that they too can benefit and accelerate the realization of their financial goals. But I found out that it is easier for OFWs to put their hard-earned money to “get-rich quick scheme” than in legal financial instruments. When they save, they will just put it in banks as Time Deposit. There are more OFWs who are not even saving and many are getting into debts unnecessarily. Unfortunately there are also those who exploit this lack of financial knowledge of OFWs by luring them into financial products and investments that might not be aligned with their goals. This is when I realized that there is so much to be done. This is how OFSI was born. The challenges I faced in my financial journey paved the way for OFSI. It is a culmination of my desire to help fellow OFWs in their quest for financial freedom and abundance. It is a humble contribution to lessen the cry of many OFWs who are always longing to be HOME, envisioning that in the next generation of Filipinos - overseas employment will no longer be a need but just a choice for most Filipinos. It is by the grace of God that I met like-minded OFWs who share the same passion and advocacy. And we continue to meet many OFWs who are journeying with us and helping us to reach out to more OFWs and their families. OFSI is a modern day bayanihan – OFWs helping fellow OFWs achieve financial freedom and abundance. Be Real Heroes OFWs. Be financially literate so that you may be able to achieve your dreams without staying that long overseas, away from home. Let us all journey together towards a financially free and abundant retirement. 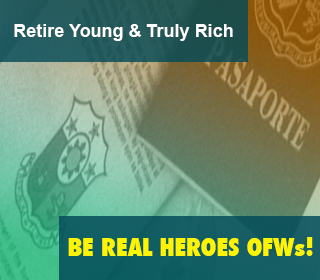 Let us all Retire Young and Truly Rich OFWs. OFWs make great sacrifices. We deserve nothing less than a great retirement!